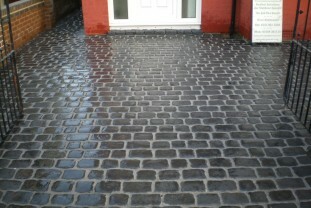 Here in the Crosby district of Merseyside,we installed the Marshalls Cobbletech system on a replacement driveway. The chosen colour was Basalt which complimented the Black Limestone Patio and Granite water feature, which we also installed in the clients rear garden. 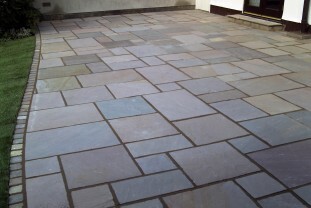 Marshalls Autumn Brown Indian sandstone, installed in Aughton Lancashire area. In 2012 Crosby Landscapes where awarded a Large Gold as well as the Finchet Trophy for best in class. To cap an already great show, TV celebrity gardener Alys Fowler then presented us with the ultimate accolade, the Pontins Trophy for best show garden. For a free no obligation quote on any sized job, please get in touch. © Copyright 2012 - Crosby Landscapes.